Herefordshire poet in residence Adam Horovitz was commissioned to write ‘February in the Physic Garden’ at Hellens, Much Marcle. This inspired the Poetica Botanica. 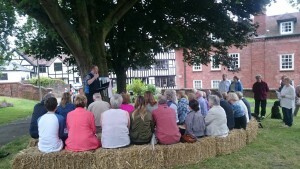 Contributors read their poems at this delightful event in the Walled Garden in the heart of Ledbury with the sounds of the town in the background.